I discovered The Baker and The Chef, after spotting fluorescent green balloons fluttering about on their sandwich board on Cambie street. After having their Main sandwich I couldn’t help but think of one of my favourite Friends episodes. The show where Ross losses it after someone at work eats the Thanksgiving Sandwich (with the Moist Maker) that Monica made for him (You can watch the clip here: http://youtu.be/Of3b4ZzJJuk). If a Panini press is involved, I find the warmth of the grill can wilt raw greens like lettuce & spinach, which removes their crunchy texture and releases moisture, making the filling soggy. The Baker and The Chef bakes its own bread and they don’t seem to use pressed together deli meats you can get at your grocery store. Over a few visits, I was able to try 4 of their sandwich creations: the Capilano, the Cambie, the Cypress and the Main. Out of the 4 items I tried, I liked the Capilano the least. The Capilano was a Panini style sandwich using foccacia bread that was sturdy but not dense. The filling contained grilled chicken breast (moist but a bit bland), Brie cheese, mixed greens and creamy pesto sauce. I thought the Brie cheese & creamy pesto sauce made the sandwich too heavy for my liking. In addition, the Brie also overwhelmed the rest of the ingredients. 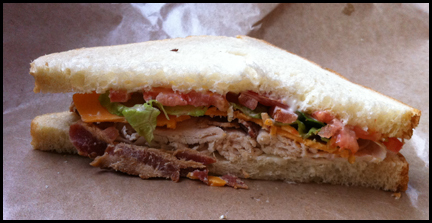 The Cambie is The Baker and The Chef’s version of a Turkey BLT and comes with turkey, bacon, cheddar cheese, lettuce and tomatoes. For the Cambie you get a choice of bread and I selected their white bread, which was fluffy. The sandwich reminded me of a sandwich you would make at home for yourself. The turkey was moist and the ingredients were of good quality. The only thing I would change is their bacon; I wish they would crisp up the bacon instead of using cold bacon. The Cypress is another Panini offering and the only vegetarian option among their sandwich creations. The sandwich contained roasted eggplant, bell peppers, zucchini, garlic, raw onions, hummus and topped with a balsamic vinaigrette. Since most of the veggies were already pre-cooked, they didn’t release any water when heated. The hummus was key as it helped give sustenance and made the sandwich more filling. I was surprised I liked this veggie creation because of the different flavours involved. It had sweetness from the peppers, tartness from the balsamic vinaigrette and an earthiness from the eggplant and hummus. The sandwich I liked the most was the Main. It’s a Thanksgiving sandwich minus the “moist maker”. The sweet cranberry sauce paired well with the salty pesto mayo. The turkey was moist and plentiful. The pea shoots gave a nice crunch and weren’t stringy. For the Main, I select the garlic pane, which was soft. I thought all the ingredients worked well together and it was very filling. 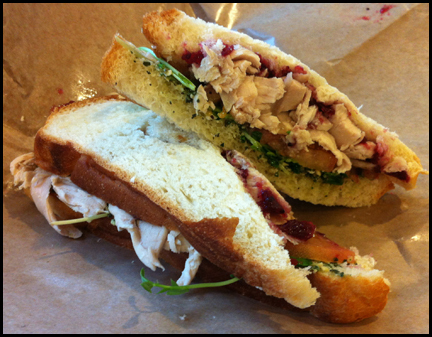 I’m happy I found The Baker and The Chef and can now enjoy a Thanksgiving Sandwich year round. Previous Post Wow, You’ve Got Something There! – The Cheeky Boys from Le Tigre.